Then I remembered a great piece of old aged wood that RancherMan had to cut off the original boards we were using for the headboard because it was split. But I loved the split. And the ridges. And the knot-holes. It was a beautiful piece of aged wood. So I asked him to save it for me. My mind was spinning on ideas to make a meaningful pictorial wall feature. Now there are lots of artistic people in my family. MOST members of my family actually! But the artsy tendencies skipped me for some reason. Oh I can usually plink something out if I can see a picture of it first and go verrrry sloooowly. But I’m not good at actually picturing a project in my mind and seeing it through to the finish and having it turn out even remotely the way I originally envisioned it! I’m also the eternal optimist so I jumped in with both feet anyway. 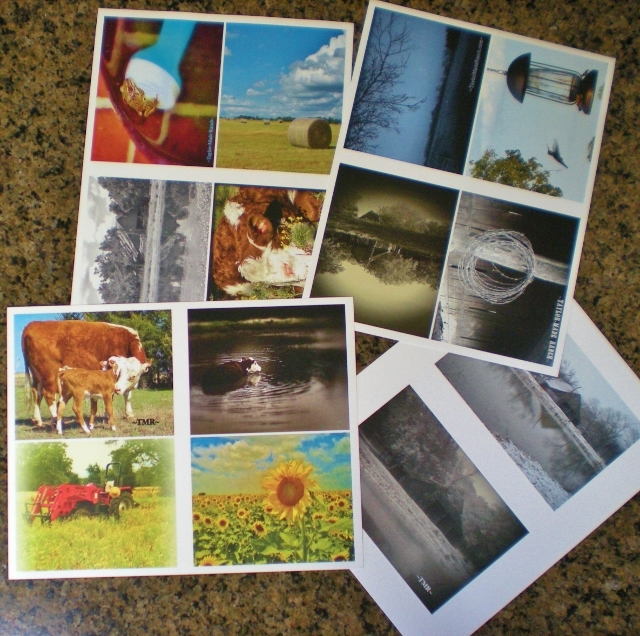 So I picked out several pictures that I had taken around our homestead over the years & contacted a local printer in town. Bada-bing, bada-BOOM for a whopping $1.29 and in about 24 hours time they reproduced several full-color pictures for me. Gotta love living in a small town! I KNOW! I’ll cut out pieces of cardboard and mount the pictures to them, almost like matting. But where to find the cardboard for the mats? I started looking around the house for colors, textures & thicknesses I wanted and found the perfect thing. Using one of my prints as a template I cut out appropriate-sized squares of cardboard for my mat. Yeah, I like that! So far, so good. Then it was simply a matter of a few squiggly lines of glue on the back of the pictures, attach the mat and use two of my heaviest books to press the pictures to the mats for awhile. Can you tell that I love me some Amy Dacyczyn? Her * Tightwad Gazette books were faves of mine. So much so that I bought the book that had all three volumes AFTER receiving one volume as a gift in the 80’s and buying the second volume myself in the 90’s. You Tightwad Gazette lovers know what I mean. I think Amy would be so proud of this project! Now that the pictures are cut out and glued to their mats I turned my attention to that old barn wood board. Sigh… What a beautiful piece of wood. So interestingly ridged. Such perfect patina. So beautiful. And since it came from my own old barn so meaningful to me. Then I hammered a couple of star-headed nails on each end of the board, strung & wrapped some jute-like baling twine and attached some vintage clothes pins so I could tell what kind of spacing I’d need and how many photos I could use. Now this wall-feature board is going to be hanging on the wall. In our guest room. OVER THE HEADS OF OUR SLEEPING GUESTS!! There’s no better way to be declared the worst hostess ever than maiming your guests in their sleep during their overnight stay at your hacienda… So I wanted to make absolutely sure it was secure when I hung it on the wall. I asked RancherMan to put some heavy picture-hanging wire on the back of the wood, using screws to anchor it in place. I love it, and it came out exactly how I hoped it would. (fist pump!) But because it’s apparently my nature to be cruisin’ for a bruisin’ I can’t leave well enough alone. I’m now in the process of painting some of the furniture in the guest room distressed white to tie in the old farmhouse theme I’m looking for. Now I enjoy painting to the degree I would enjoy, say, a root canal, but I’m determined! Because I’m distress-painting the furniture in this room with white paint, I’m thinking about maybe milk-washing this old piece of wood to tie the aged barn wood patina of the headboard with the distressed white of the other furniture. But then again I may leave it alone, it looks great like it is. Decisions, decisions… Whaddya think? * A word about our Affiliate Link – We are currently enrolled as an Amazon Affiliate. Occasionally I will insert an affiliate link into one of my posts if I think it may be of interest to you. Both of the items linked in this are things I use and love! If you click on any of my affiliate links and buy something (almost anything, not just what was linked) I get a small referral percentage from Amazon. But here’s the really important part – the price you pay for your items is UNCHANGED. When you buy something through the affiliate link it’s a great way to support this blog without anything coming out of your pocket. So please click often! This entry was posted in Blog Posts and tagged Barn, Environment, Frugality, Make-It-Yourself, Ranch Life, Small Town Living on July 13, 2014 by Texas Homesteader. You did such a great job with this! It turned out beautifully. Thanks for posting on the #WasteLessWednesday blog hop! Love it! 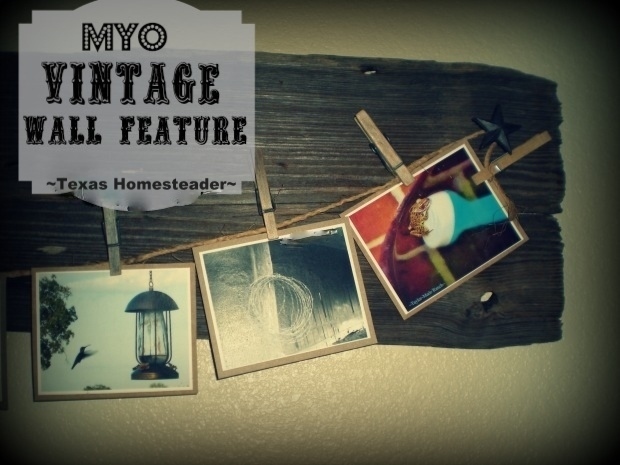 I love using reclaimed wood for projects and I love me some Tightwad Gazette! Thanks for sharing! What a fun little DIY project. Thanks for sharing with us on Simply Natural Saturdays. I love this! The rustic appearance adds so much charm, and so thrifty too! Well done, thanks for linking up to Merry Monday, I can’t wait to see next week’s! Cute!! Thanks for sharing on My 2 Favorite Things on Thursday!! Hope to see you again this week! I love having you!! Pinned! I love this! I made a similar one years ago that I use all the time. Thanks for sharing it with us. Visiting from Our Simple Homestead blog hop. Oh wow!! I just love this! I collect all kinds of driftwood pieces from the beach -and I need a headboard -and I take lots and lots of pictures! I am definitely going to do this! thanks for sharing this great idea. Thanks so much for sharing at Simple Lives Thursday; hope to see you again this week! So cute! I did something similar with an old wooden frame and some chicken wire. I love utilizing old stuff to make something new! I love this idea. I also think it would look good painted white and distressed. Maybe use a black cardstock as the backing for the pictures. Thanks for the inspiration! It looks great. I think if you are leaving the wall that light color I would leave the wood alone. Super cute idea…where did you get the star nail heads? Those are so neat. Thanks for sharing on Merry Monday. Can’t wait to see the room all finished. What a great idea! I like it just the way it is. Thanks so much for sharing at Simple Lives Thursday, this post really speaks to the heart of simple living. Hope to see you again this week! I just love this idea, thanks for sharing. I want to let you know that I will be featuring this post on Tuesday’s with a Twist so please stop by for a peek. Have a great day. A simple and easy way to re-purpose old beautiful wood:) Love it! I received The Tightwad Gazette in the mail as a newsletter. I saved all the copies and kept them in a notebook. I poured over them constantly and loved them! I have some photos that I’ve been trying to figure out what to do with and I believe you just gave me an idea. Thanks. I do have to say as a photographer I cringed a little when you used elmer’s glue on a photo (Not good for longevity). The natural wood look is amazing, it gives the images a nice “clean” backdrop. All three of Amy Dacyczyn’s books are on my bookshelf. They were like my second bible when my kids were growing up. Your wall art ties in so well with the headboard. You should be proud. There’s such a sense of satisfaction when you can take something that most people would relegate to the land fill and turn it into a useful and versatile piece. Nice go’in. 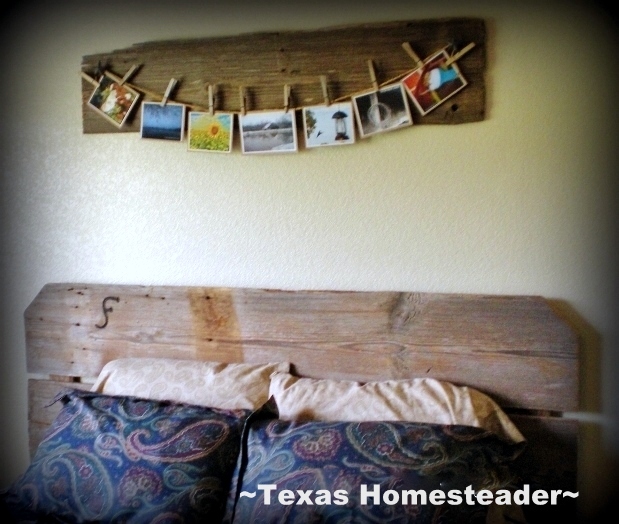 Loving this project, that piece of wood is gorgeous and looks great above the bed with your photographs. Nice Job! And you said you are not artistic. Silly girl. What a Beautiful and clever idea. Love that. Very nice; simple and easy project to do, plus you can change out the pictures whenever. It goes so well with your headboard but I’m surprised that you didn’t use your branding iron and brand in your ranch’s emblem; ‘ Sunrises Forever.’ Enjoy the remainder of the day and have a wonderful evening.